We entered the theatre to see a totally dark stage area, sparsely furnished with six unmatched dining chairs and a man, dressed in black, looking upset and sitting on one of the chairs, clasping and unclasping his hands in an agitated manner. The stage was ready for the second show of the night Sikes & Nancy. I felt on much safer ground here. I have seen the musical Oliver on many occasions – both on stage and film – and although I knew that Bill Sykes kills Nancy, I also “knew” it wasn’t that bad as storybook deaths go. Turns out I was completely wrong as adaptor/performer James Swanton, in a fitting homage to Charles Dickens’ style of public story-telling, recounted the fateful story of the two star-crossed lovers from Oliver Twist. I’m being unfair here, James didn’t just tell the story, he became the story. He transformed himself into the oily Fagin, arranging for Nancy to be followed and watched by Noah, playing both parts simultaneously yet making each an entity in their own right. It was eerie to watch him using voice, face and posture to bring both characters to life. James, as narrator, took us with Noah as he followed Nancy to her meeting with Rose and Brownlow, where a three-way conversation took place under London Bridge, making great use of the chairs. Nancy sounded, and looked so young. Obviously scared out of her wits, needing to do the right thing by Oliver but also protecting the man she loved so much. Finally, we were introduced to Bill Sykes himself and it seemed that James physically got taller and beefier as Bill confronted and dominated Fagin, who spun his tale of Nancy’s “betrayal” to him. Bill’s confrontation with Nancy is both horrific and mesmerising. Told in words and actions, the story is exactly as written in the original and, being described as one of the most graphic, frightening scenes Dickens has ever written really doesn’t do justice to the performance on stage. James’ acting skills were truly amazing in this scene and in the subsequent one as Bill tries to run away before returning to Fagin and his eventual fate. I have to say that this performance really affected me and when I left the theatre I stood quietly for a few moments on Whitehall contemplating what I had just witnessed. A fantastic, if at times disturbing evening’s entertainment. Miss Havisham’s Expectations and Sikes and Nancy were amazing in different ways and both taught me so much not only about Charles Dickens but about the craft of acting itself. One-person shows are difficult to pull off successfully but tonight Linda Marlowe and James Swanton delivered a master-class in the art. 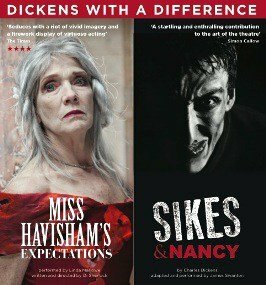 Sikes & Nancy is a play adapted and performed by James Swanton based on the legendary readings Dickens himself used to give. Swanton, dressed entirely in black, enacts the compellingly and terrible story of Dickens’ most famous murder. 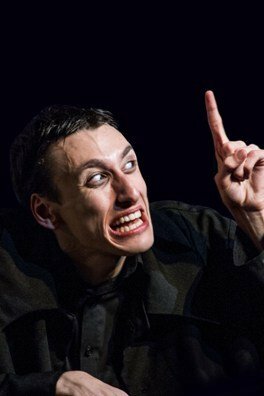 His tour-de-force performance of this masterpiece of Gothic melodrama sees him transform seamlessly from the revolting Fagin to the unfortunate Nancy; from the righteous Brownlow to the ferocious and terrifying Sikes. This bravura storytelling is exciting, dark, physical and brutish. Charles Dickens adapted Sikes & Nancy from the grislier material in Oliver Twist. These notorious readings shocked audiences into silence; women would scream and faint. ‘I shall tear myself to pieces,’ Dickens vowed before one performance. In fact, it is now thought that the strain of the readings hastened Dickens’ early death.